(nb the scaling on this graph is wrong. RH and LH axes are both in millions, not 000s as stated). Would anyone care to explain why UK employment seems to have risen hugely since mid-2011 but unemployment has only fallen a little in that time? 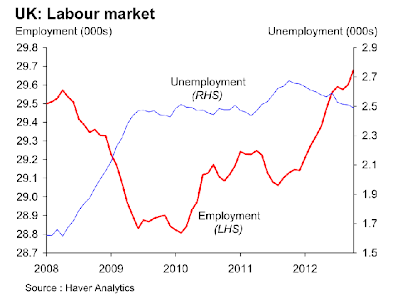 And that was on top of an employment rise in 2010 that was not matched by an equivalent fall in unemployment. Who are all the additional people now in employment, why have they suddenly decided to start working and what are they doing? Answers in comments, please. Or on email. Or on twitter. I really don't have an answer to this. Do the self employed increase the employed count? Could the increase be people who aren't working but who are also not claiming (either because they're not bothering or can't due to savings) going back into work. Could those not working be due to redundancy or retirement. Both of these would be due to the squeeze on fixed incomes due to low interest rates and inflation. - single mums and disabled entering the workforce due to changes in benefit rules. These are most likely to have pushed up the unemployment figures. It isn't people who lost their jobs in the 2009 recession, as far as I can see - the chart shows a corresponding increase in unemployment at that time. Only anecdotal, but I see quite a few people entering the workforce that were previously not looking for work. It's not just falling incomes, but also falling wealth and estimated future wealth. For example I know a few families that were, erm, let's say "living beyond their means" because they saw their raising property values as paying off big time somewhere in the future, and this no longer looks like a safe bet. here's the natl stats page for the UK labor market; there must be technical notes that explain how the numbers are arrived at..
Or "as well as studying". Employment figures include students working their way through college or uni. Part-time jobs / cheaper jobs, independent from how those are 'created'. I think this is the main reason. U.K. is hard to compare, you have many people from other parts of the world too. In a boom unemployment is lower but your people work everywhere in the world. U.K. does have a more flexible way to treat jobs and setup companies. What is rising is the unemployment of people at the age younger than 25 years. I have been following Spain and after a certain period the impact of statistical errors remains constant. The unemployment number is interesting concerning transfers. It's an indicator but in very stable not saturated economy. I read somewhere that if you work more than an hour a week you are counted as 'employed' in the official stats. However if you work less than 16 hours a week you can claim job seeker's allowance and are counted as 'unemployed'. That surely leads to double counting and confusion. I think there might be a DWP-related (partial) explanation for some of this: since May 2011 the DWP says it has been reassessing the cases of 7,000 Employment and Support Allowance claimants per week. In total it will be reassessing 1.5 million cases. The tests which are taking place impact on both economically active people receiving one element of ESA and economically inactive people who are receiving another. The DWP also says that more than half of existing claimants are categorised on reassessment as Fit For Work, meaning there are quite a lot of people coming into unemployment statistics from being economically inactive, but excluded from unemployment methodology. 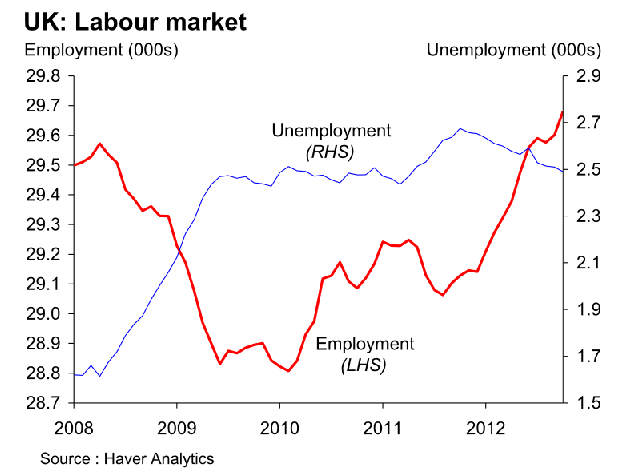 Unemployment is growing but not entirely from a group that was previously counted as employed. I don't have data on the number of people who have moved from economically inactive on ESA to unemployed, but given the fact that 1.5 million people are in the process of being reassessed, it seems like it could have a effect. I agree. I think the ESA changes and reassessment are a big part of the unemployment/employment puzzle. Plus single mums with school-age children, who also were economically "inactive" and many of whom are now unemployed. I suspect that the unemployment figures are propped up by the entry of these two groups. I think the ESA changes and reassessment are a significant contributor to the productivity puzzle, too. Employment started to rise and productivity to fall in mid-2011, just as the ESA reassessment was getting going. Coincidence? Not convinced. I've mentioned this in my post on productivity.